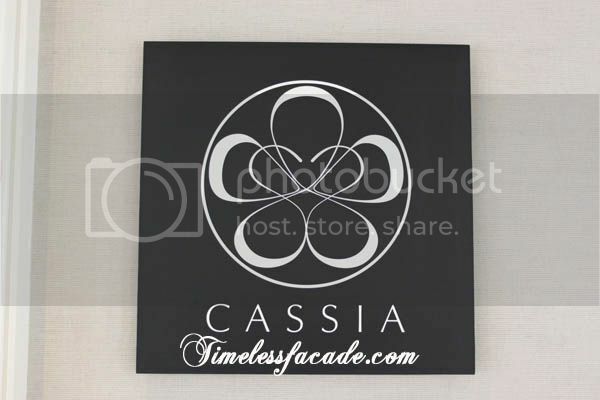 Cassia is a tree that is related to Cinnamon and from which the spice, cassiabark, is derived from. 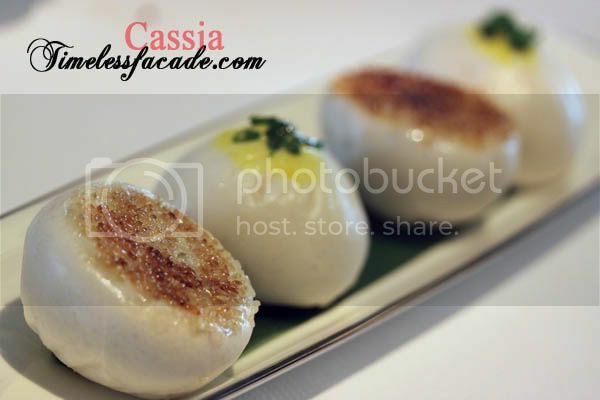 It also happens to be the name of the newly opened Chinese restaurant at Capella Singapore, which offers traditional Chinese cuisine blended with haute Cantonese techniques. In short, modern Chinese cuisine. 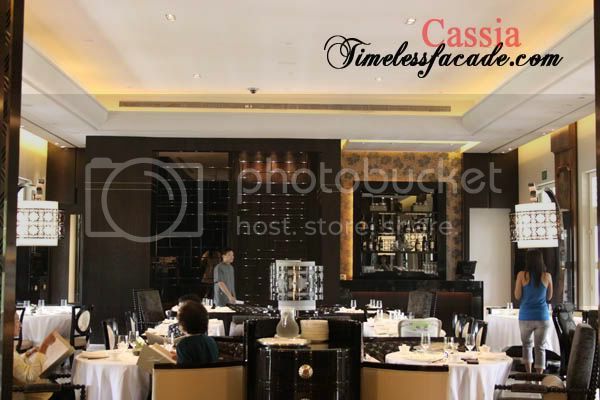 The place is helmed by Executive Chef Ooi Soon Lock, who had stints in HK, Malaysia and Ritz Carlton Singapore. 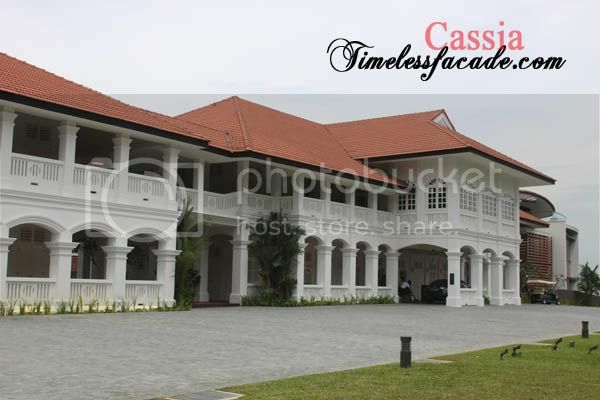 Located at the upmarket Capella Hotel at Sentosa (where rooms start at $650/night), Cassia sits on the 3rd story of this stunning colonial style hotel complete with a sprawling driveway. 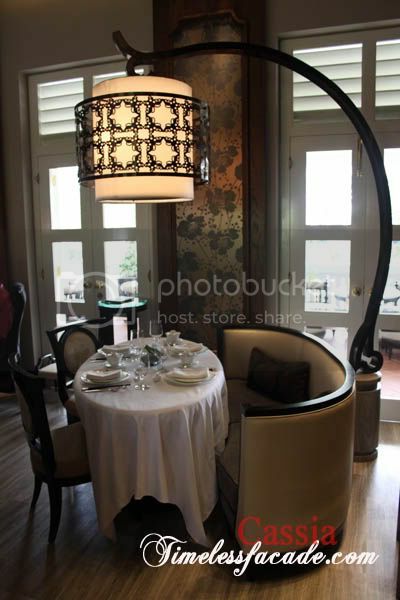 The restaurant in itself is another work of art, with its lime stone lined entrance and intricately cut black lamp shades that provide a nice warm glow to the place. Seats are comfortable with plush cushions and the cutlery reads Narumi and Christofle - really expensive stuff. 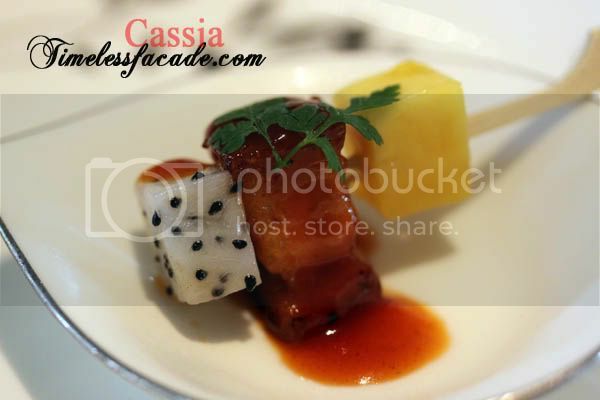 Served chilled, the amuse bouche of dragonfruit, pork belly and mango was quite a novel way to start off. The pork was surprisingly firm with a mild hint of barbecue sauce but the fruits didn't quite feature in the overall taste. 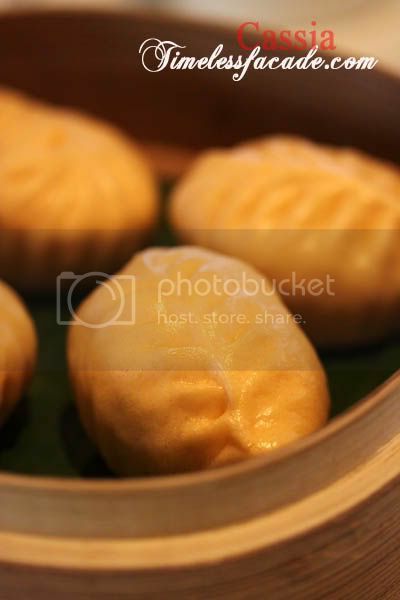 The custard bun didn't come in the customary bun shape but in a oblong dumpling shape. It was evidently hand made from the nips in the skin. The custard filling was smooth with traces of egg yolk sediment but reminded me uncomfortably of kaya(coconut jam). There was an overload of flour as well. 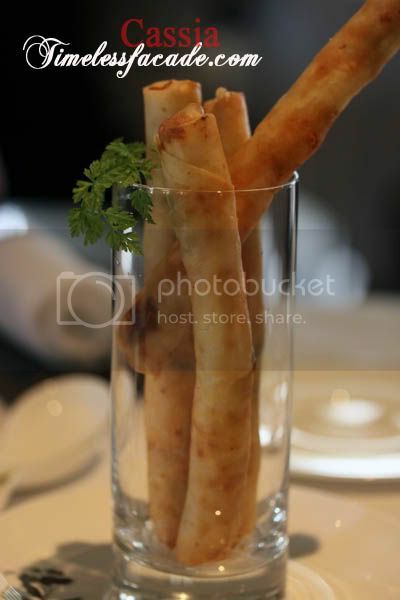 I thought this dish was quite decent, with the spring rolls crisp without coming across as too oily. The prawns were crunchy but I couldn't quite make out the taste of cheese though. Nice as a finger food. Foie gras is the key here but sadly, I couldn't quite make out any in the rolls. The beancurd skin was limp and not the least bit crisp but at least the prawns were evident and crunchy. Now where's my foie gras? Honestly, I have no idea what constitutes Pi Fong Tang Style but I do know this. The carrot cake was too soft and mashy. And honestly, it could really do with a little more flavour. On the upside, it wasn't excessively oily and deep fried garlic is always nice, albeit irritating as it tends to stick to your teeth when chewing. 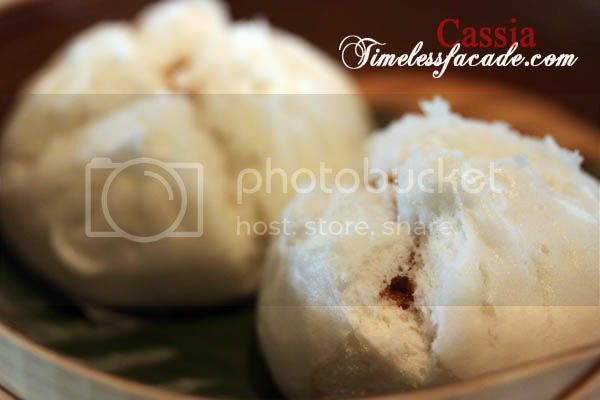 I must admit that I enjoyed the pork buns aka char siew bao. The char siew filling wasn't cloyingly sweet and the meat pieces were plump and juicy. The skin was soft and moist too, just that there was a little too much flour. Comfort food to say the very least, the crispy prawn dumplings weren't out of the ordinary but competent enough to warrant a decent grade. 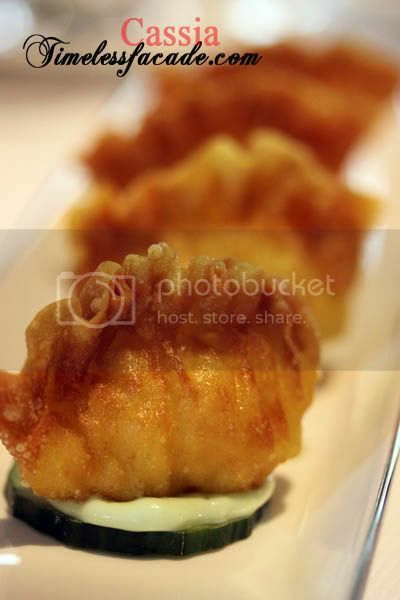 The wanton skin was crackling crispy and the prawn huge and sweet. It was served on a cucumber spread with a thick layer of wasabi mayo that didn't threaten to overwhelm. 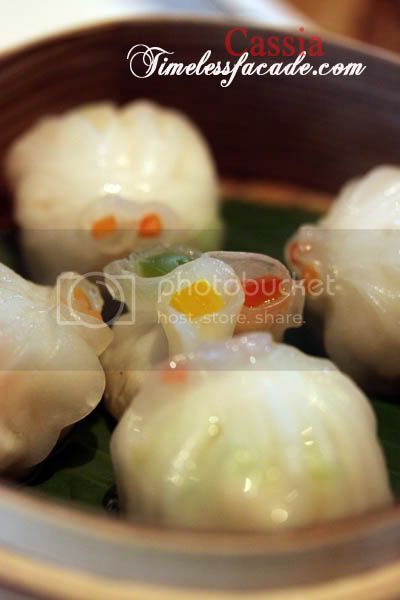 The quintessential dim sum dish - har gao. The skin was thin and slightly elastic while the whole prawn was fresh and crunchy. The addition of bamboo shoots and celery gave it an extra crunch but thats about it. This is actually quite interesting stuff and I must admit that its the first time I'm having something like that. 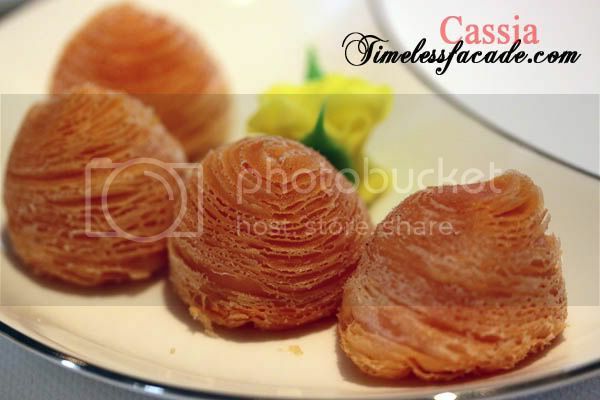 The pastry was flaky and inside was mashed papaya that came across as mildly sweet. Would probably be more suitable as a dessert in my humble opinion. I have mentioned this countless times and I shall say this again. Mincing wagyu beef is a blatant and shameful waste of good beef. And this was no exception. The bun was speckled with sesame seeds and then pan fried till the seeds turned golden brown. There was no inherent beefy taste and in its place, a strong taste of spring onion. 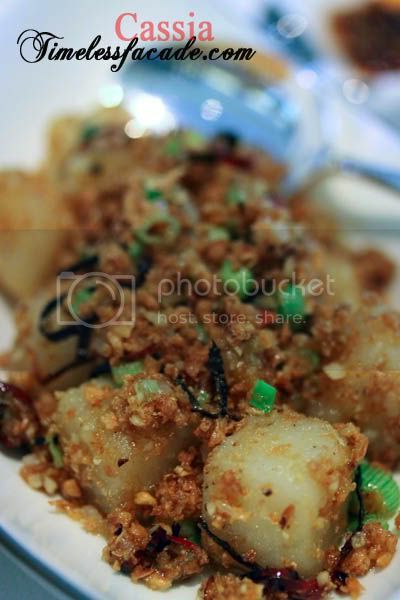 The water chestnut gave it a nice crunchy texture though. In case you are questioning where the truffle went to, I have that same question in mind. 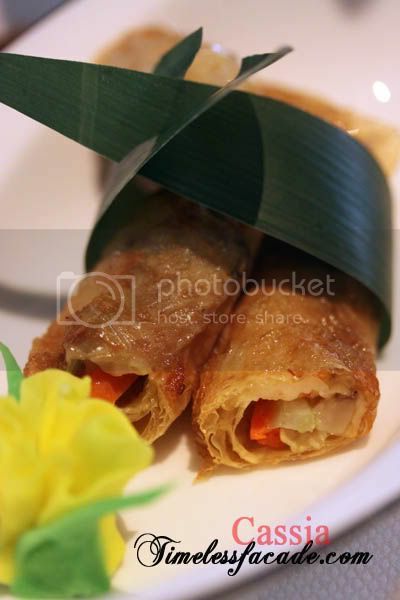 The filling in the siew mai was probably part pork, part prawn paste, hence the noticeable absence of the porky taste. 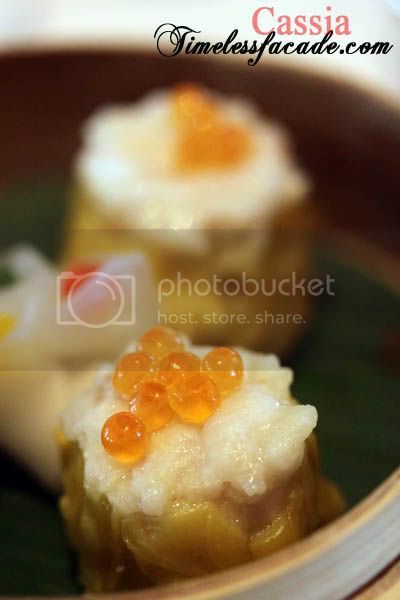 However, the salmon roe proved to be a little too fishy for me and this dish in general. I wonder if the roe could have been better utilised? 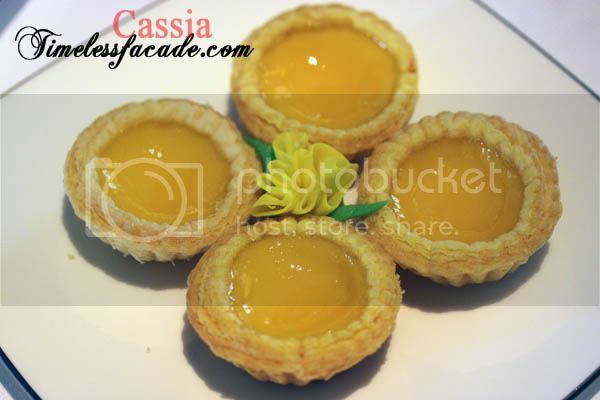 I thought that the egg tarts were quite decent, albeit rather smallish in size. The crust wasn't too flaky and had a oat aftertaste (oat flour?) while the custard was quivery and not too sweet. Nice, but not that nice. 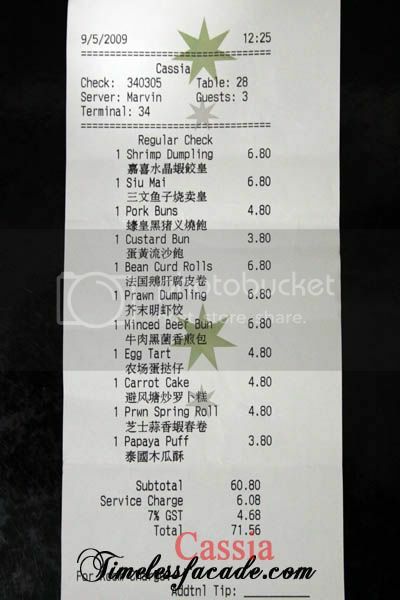 An uninspiring and partially filling dim sum session set the 3 of us back by about $72, which isn't alot of money. Food hovers around average to slightly above average but with the quality and quantity, I'll be hard pressed to find a reason to return. 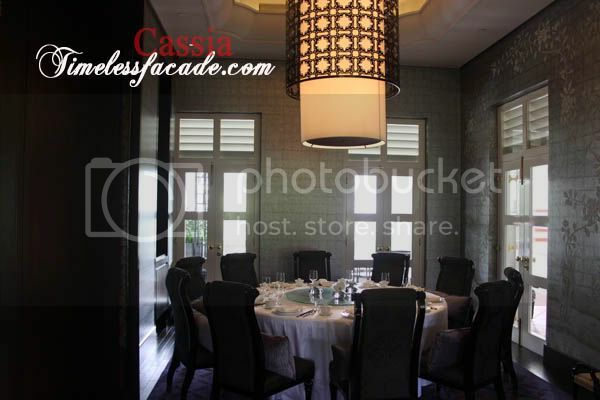 Maybe only for the ambience and exclusivity? And even if I do, I'll probably just stick to the dim sum. I mean, with prices like $12/pax for tea or $5/bowl of rice, one would be either have to be obnoxiously rich or simply deranged to actually do dinner. This place sounds gimmicky with all the French Foie Gras, US Berkshire Pork, Thai Papaya Australian Wagyu Beef, Truffle Norwegian Salmon Roe, Farmed egg. It's just dim sum. Yep its quite gimmicky honestly. Gimmicky food with an overload of deep fried dishes. Maybe they were hoping we'd order come chinese tea to go along, haha.